Spice up your chord selection with Uncle Tim's Suspended Fourth Triads eBook. Suspended Fourth triads are built on diatonic triads but they use the fourth degree instead of the standard third degree. This suspends the chord towards the fourth degree. It is neither a major or a minor chord since the third degree is not present. It is the third degree that determines if a chord is major or minor. Once you take away that choice you get a chord that is suspended. In this case the third has been suspended for the fourth degree. Playing and substituting suspended fourth chords takes practice to be able to use them effectively. But once you begin to integrate them into your playing, they will inject a unique sound that is very pleasing and often can be substituted for standard major or minor chords. In this illustration you can see the suspended triads cascading down the four - three string sets. Notice that these suspended fourth triads are all still in the key of C major and A minor. Only the notes of the key have been used. Also notice that they flow in alphabetical order, starting on whatever the first chord in the cascade is. Each cascade is different too. This gives you lots of choices as to which exact chord voicing you use. And since these cascades are based on the C major scale, you can easily see how the scale not only creates these chords, but also how you can play the scale against these chords and construct secondary chord and lead guitar parts. This is an excellent way to mix in chords with your lead playing. These Suspended Fourth triads are constructed by using the fourth degree first, then the fifth degree and then the root (first) note. As you look over the cascades, you can now begin to see that the scale is responsible for creating these cascades. They only contain the notes of the C major scale and every note in the scale can spawn a chord. In fact at least three triads (one for each inversion). When you use any of Uncle Tim's eBooks you will always progress through each key by way of the Circle of Fifths. 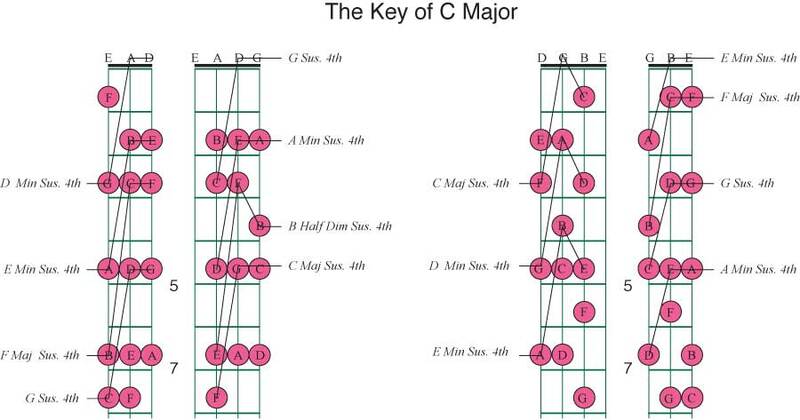 This is how music is created using a key based approach and these chords are created by applying the rules of theory to the key of C major using Uncle Tim's unique visual method. 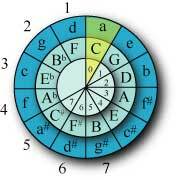 The Circle of Fifths starts out with the key of C major and proceeds by building each scale. We progress through the same sequence when creating cascades based on the scale. This is a very good way to tie this information into other information about each key that you already know. So you can expand your knowledge and begin to tie everything together. And these triad cascades offer excellent practice for finger gymnastics. They go nicely with scale practice too. Remember each and every eBook is covered by Uncle Tim's incredible guarantee that you must love this eBook or you can return it at any time for a full refund. We really believe in this method and believe anyone who uses it will grow into the full benefits of seeing music visually and in context with the rules that create it. Over time seeing music this way and help you to become musically grounded. Soon everything begins to fit into place and form a complete understanding of key based music. If you are looking for a way to introduce new chords into your playing, Uncle Tim's first Inversion triads can give you the lift you are looking for. Try an eBook today and begin the incredible journey with Uncle Tim. Use the Paypal option to gain immediate access to this eBook or shop at the Uncletim store. Access takes a little longer that way. Click here to enter Uncle Tim's secure Store. This is not an immediate access option.